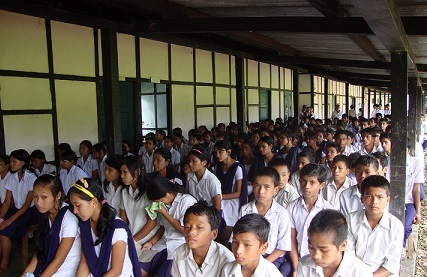 After poor performance in the CBSE examination results this year in Arunachal Pradesh and suspension of a principal and a headmaster of two schools, Changlang Deputy Commissioner Wayong Khimhun also warned of stringent actions against the non-performing Government school teachers in the district during a review meeting held at the district headquarters of Changlang recently. Taking strong cognizance of the poor results in Arunachal Pradesh in the CBSE examination, Arunachal Pradesh Education Minister Wanglin Lowangdong suspended a principal and a headmaster of two schools recently following thorough review of the CBSE Class X and XII Examination results. The review meeting at Changlang, which was attended by all the administrative officers, principals and headmasters of the higher secondary and secondary schools of the district, had a threadbare discussion on raising the standard of the quality education with zero per cent tolerance to absenteeism and negligence of duty on the part of the teachers and education department officials of the district. Expressing disappointment at the poor results of students in the district in the CBSE examinations, Khimhum asked the principals, headmasters and education department officials to work with dedication to improve the pathetic educational scenario in the district. He also advocated for utilizing smart class and to generate desirable outputs in the days to come. The meeting discussed every pros and cons for poor results in the district including absenteeism, proxy-attendance and escapist mentality among the teachers, distribution of text books, disbursement of stipend, generation of ADHAAR cards, opening of account of the students, etc. Urging on the DDSE, principals and headmasters of the schools to ensure hundred per cent ADHAAR generations for compulsory disbursement of students’ stipend through the DBT, the DC directed all the principals and headmasters of the schools to charge admission fees strictly following Government norms as per the RTE Act. On the shortage of teachers and infrastructures in the schools, the DC asked the DDSE, Changlang to submit proposals immediately to the Higher Department through the district administration. It may be mentioned that Government schools of the State have continued to maintain dismal performance in the All India Senior School Certificate Examination (AISSCE), registering only 44.33 pass percentage this year – just one per cent ahead of last year’s record, 43.44. Nearly 11,153 students from 84 Government higher secondary schools appeared for the AISSCE 2018, but only 4944 students emerged successful while in 2017, out of 16,614 students who sat for the examination, 7218 passed, 5947 failed, and 3160 earned compartment. Surprisingly, Lower Subansiri district marked the lowest pass percentage this year, with an abysmal figure of 3.23 at the Government HS School, Talo. Out of 31 students there, only 1 student cleared the AISSCE 2018. East Kameng followed with a 3.98 pass percentage wherein 7 students passed the examination from the Government HS School, Bazarline in Seppa out of 176 students. The Government HS School, Kanubari in Longding district stood third among the worst performing schools, with 12.93 per cent students clearing the examination. Out of 116 students there, only 15 cleared the examination. Kurung Kumey district performed well – leading the table among the best performing schools – with a pass percentage of 92.86 at Government HS School, Sangram and 90.91 at Government HS School, Nyapin. Sources at the State Education Department said that in one of the worst CBSE results in the history of Arunachal, only two out of 108 students from Government HS School, Bilat (East Siang) managed to pass the Class X CBSE examination, the results of which were declared on May 28. In another Government school at Riga in Siang district, none of the 28 students, who appeared could pass the Class X examination. It may be mentioned that the State has recorded pass percentage of only 58 pc in Government schools this year in CBSE Class X Examination while 46 in Class XII Examiantion. Meanwhile, earlier on June 14, the Education Minister reviewed the CBSE Class X and XII Examination results along with Parliamentary Secretary (Education) Tsering Tashi and senior officers including Secretary (Education) Bidol Tayeng, Director of Secondary Education, BN Lendo, Director of Elementary Education T Gao and SCERT Director G Lazi among others. The Education Minister stated that the shortage of teachers in the State “cannot be the reason for 0 pc or 2 pc pass percentage in the Class X Examination”. He directed the Secretary (Education) to evolve a mechanism to review academic functioning of the Government schools from time to time for better performance in CBSE Examinations. Education Minister Lowangdong also directed the department to take stern actions against those officers and teachers who are neglecting their duties.